Another spotlight! If you are or represent an upcoming artist, designer, dancer, etc., and are interested in a feature, please visit our Features/Submissions page for more information! 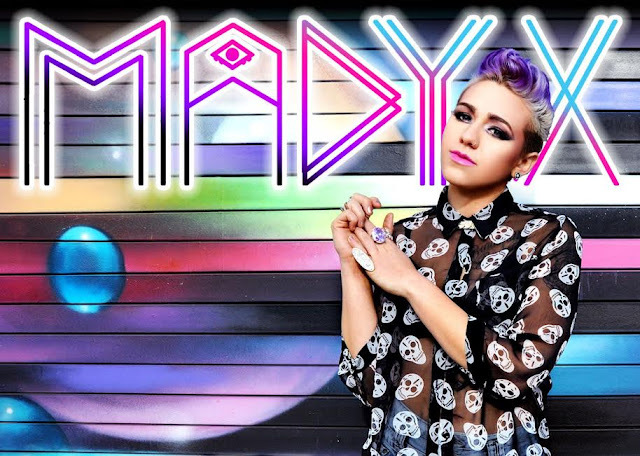 Today, we have alternative pop singer/songwriter Madyx! Born Michelle Blanchard, the artist has wanted to be in the music industry since she was a kid. “When I was 8 years old, my parents bought me a guitar for my birthday and my life was forever changed,” she said. Growing up, Madyx’s parents also always played a variety of music from classic rock to country, and that helped shape her diverse writing style. After playing in a bunch of bands during high school, Madyx moved out to LA to really build her music career and even started a band called Life Down Here. “We made a pretty good name for ourselves: getting to open for Paramore, played a bunch of high schools across SoCal and several LGBT pride festivals in addition to the Warped Tour,” she said of her band experience. However, as she grew older, her musical style changed and she parted ways with the band, and branched out her own as Madyx! “It’s been a wild ride ever since,” the singer excitedly admitted. Madyx is inspired by a bunch of great artists, with three in particular coming to mind: P!nk, Hayley Williams from Paramore, and Melissa Etheridge. “All three women are unique in different ways, but they all have that badass, strong front women persona and that’s what grabs my attention,” the artist revealed. “They are REAL and raw with their message as artists and lyrists, which is what I aim to do.” Madyx also draws inspiration from life in general, between her own and the experiences of family and friends. “I think everyone has a unique story that makes them who they are, and I try to share my story with music in hopes to relate to someone else, just like so many artists did for me,” she stated. One of the singer’s latest tracks, “Where the Wild Things Are,” is a prime example of Madyx creating music about her life, even her travel adventures! The singer started working on the song in the air as she traveled to London, her very first time out of the country! “[The title] Where The Wild Things Are” seemed pretty fitting considering I was traveling to a beautiful city I’d never been before; getting to explore and just live in the moment; not really knowing where I was or where I was going, just looking for whatever next adventure was coming,” the singer admitted. “I never imagined it would be my next single when I wrote it, but I’m pretty stoked it is!” Watch the official lyric video for the track below! You can check out more from Madyx on her official website, SoundCloud, and YouTube. You can also connect with her on Facebook, Twitter, and Instagram!